Tucker, G.C. (2009). 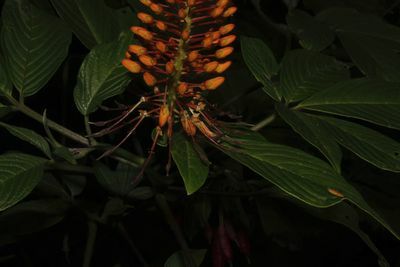 Neotropical Cleomaceae. Herbs (rarely shrubs), annual or perennial , deciduous ( evergreen in Peritoma arborea (Nutt. ex Torr. & A.Gray) Iltis; spines usually absent (present in Tarenaya Raf. and Hemiscola Raf. 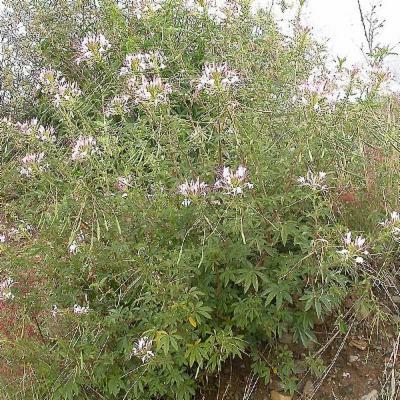 ), glabrous or glandular - pubescent , hairs stalked or sessile ; producing mustard oils. 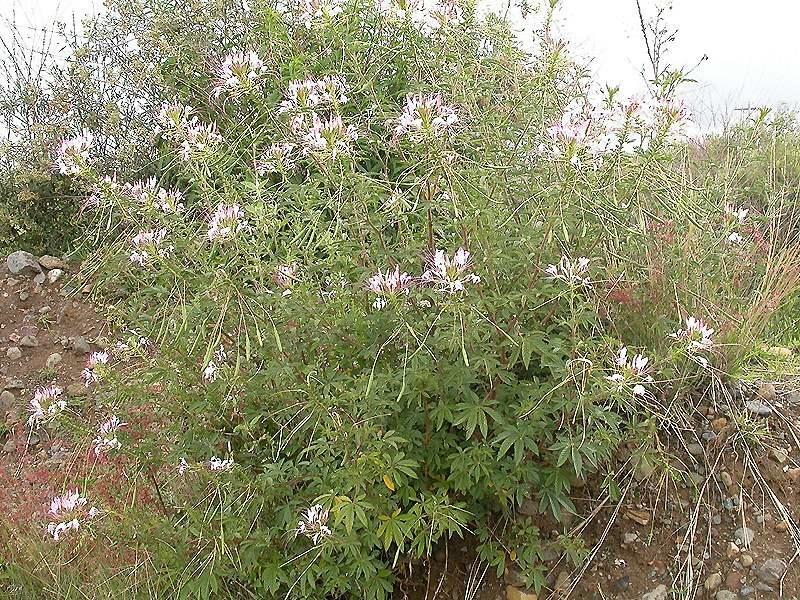 Stems usually erect , sometimes spreading or procumbent ; branched or unbranched. Leaves alternate , spirally arranged, usually palmately compound , sometimes simple ; venation pinnate ; stipules usually caducous , sometimes deciduous , 3-8- palmatifid , linear , threadlike, minute, scalelike, or absent (stipular spines sometimes present); petioles present ( pulvinus usually present, nectaries absent, petiolar spines sometimes present); petiolules present. Inflorescences terminal or axillary , usually racemose, sometimes flat-topped, or flowers solitary, usually elongating in fruit ; bud scales absent; bracts present or absent. Pedicels present; bracteoles absent. Flowers usually bisexual (developmentally unisexual within sections of racemes); actinomorphic or slightly zygomorphic ; perianth and androecium hypogynous, perianth rotate to crateriform, campanulate , or urceolate; sepals persistent or deciduous , 4, distinct or basally connate ; petals 4, attached directly to receptacle , imbricate , distinct, equal or unequal; intrastaminal nectary -discs, scales, or glands present or absent; stamens [4-]6-27[-35]; filaments free or basally adnate to gynophore (or along proximal 1/3-1/2 in Gynandropsis DC. ), or androgynophore , glabrous or pubescent ; anthers dehiscing by longitudinal slits, pollen shed in single grains, binucleate, commonly tricolporate; gynophore present or absent; pistil 1, carpel 1; ovary 2-locular, superior , placentation parietal ; style 1, (straight, short, thick) not spine -like; stigma 1, capitate , unlobed; ovules 1-18(-26) per locule , bitegmic, anatropous. Fruits capsular or nutlets (usually stipitate from elongation of gynophore , erect to divergent ), valvate , elongate (+/- dehiscent by 2 lateral valves, except in Polanisia Raf. ), or schizocarps (inflated in Peritoma arborea (Nutt. ex Torr. & A.Gray) Iltis), indehiscent or dehiscent . Seeds 1-65[-100], tan, yellowish brown, light brown, pale green, brown, reddish brown, silver-gray, or gray to black ( papillose or tuberculate ); arillate or not; endosperm scanty or absent, sometimes a persistent perisperm present; cotyledons incumbent, radicle-hypocotyl elongated. Cleomaceae has generally been included in Capparaceae. The APG2 system treats them as separate famililies. Cleomaceae forms a sister clade to Brassicaceae, and the two families together form a sister-clade to Capparaceae. The broad circumscription of Capparaceae followed by A. Cronquist (1981) was similar to that of Pax and Hoffmann (1936). Traditionally, the approximately 45 genera and 800 species of Capparaceae in a broader sense have been classified into two major subfamilies, Capparoideae and Cleomoideae. Molecular and morphological analyses of the family and its relatives reveal that Capparaceae as traditionally circumscribed is paraphyletic, with the larger, mostly temperate family Brassicaceae embedded within it (Rodman et al. 1993, 1996; Judd et al. 1994; Hall et al. 2002, 2004). Chloroplast sequences strongly support the monophyly of each of the three lineages Brassicaceae, Capparaceae, and Cleomaceae, with strong support for a sister relationship of Cleomaceae to Brassicaceae (Hall et al. 2002, 2004). Rather than merging the three families into one, all-inclusive Brassicaceae (in the sense of Angiosperm Phylogeny Group 1998, 2003), it might be more acceptable to recognize the three clades as separate, amply distinct families (Hall et al. 2002). This bears out the proposal of the family by H. K. Airy Shaw (1964), who noted that recognition of Cleomaceae was "a logical necessity." Cleomaceae can be distinguished from Capparaceae as shown below (Iltis et al. 2008). Native (few species naturalized or adventive from Old World Tropics). Genera 17, species ca. 150: worldwide, tropical and temperate. 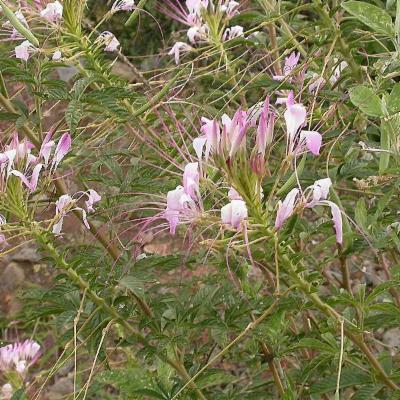 Herbaceoushabit (except Peritoma in NW Mexico). Ernst, W. R. 1963b. 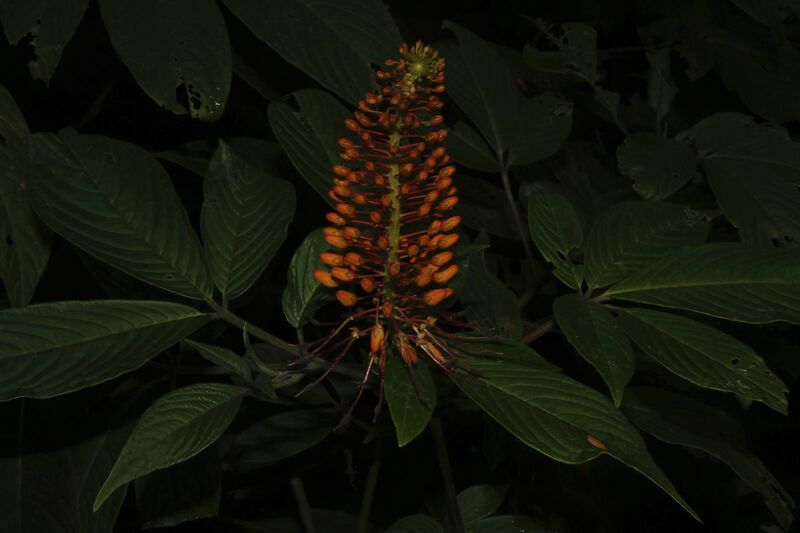 The genera of Capparidaceae and Moringaceae in the southeastern United States. J. Arnold Arbor. 44: 81-95. Hall, J. C., K. J. Sytsma, and H. H. Iltis. 2002. Phylogeny of Capparaceae and Brassicaceae based on chloroplast sequence data. Amer. J. Bot. 89: 1826-1842. Hall, J. C., H. H. Iltis, and K. J. Sytsma. 2004. Molecular phylogenetics of core Brassicales, placement of orphan genera Emblingia, Forchhammeria, Tirania, and character evolution. Syst. Bot. 29: 654-669. Holmgren, P. K. and A. Cronquist. 2005. Cleomaceae. In: A. Cronquist et al. (eds.) Intermountain Flora. 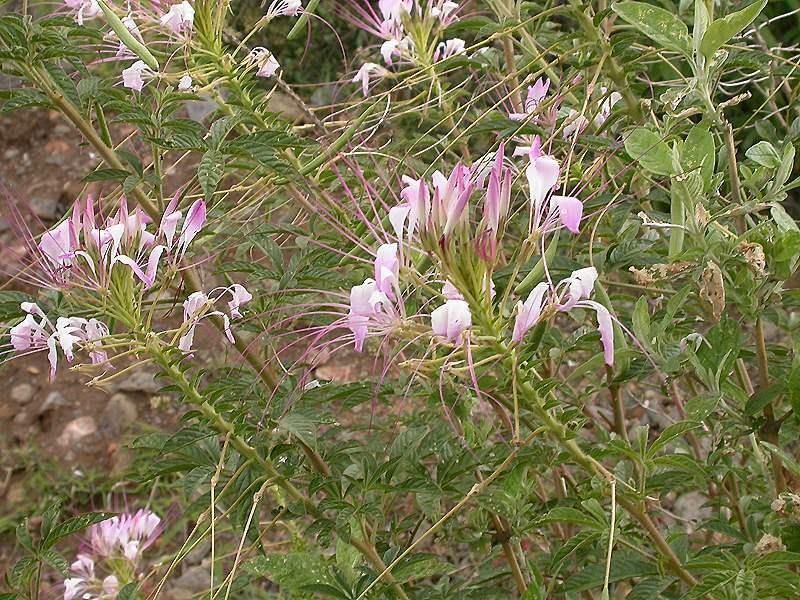 Vascular Plants of the Intermountain West, U.S.A. New York and London. Vol. 2, part B, pp. 160-174. Iltis, H. H. 1957. Studies in the Capparidaceae, III. Evolution and phylogeny of the western North American Cleomoideae. Ann. Missouri Bot. Gard. 44: 77-119. Iltis, H. H. 1960. Studies in the Capparidaceae, VII. Old World cleomes adventive in the New World. Brittonia 12: 279-294. Kers, L. E. 2003. 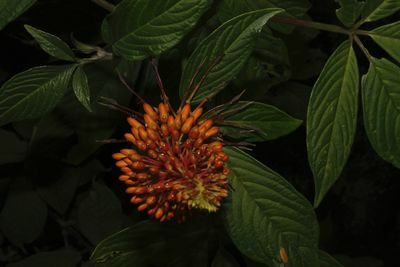 Capparaceae. In: K. Kubitzki and C. Bayer (eds.). The Families and Genera of Vascular Plants. Vol. 5, pp. 36-56. Springer-Verlag, Berlin, Heidelberg, New York. Sánchez-Acebo, L. 2005. 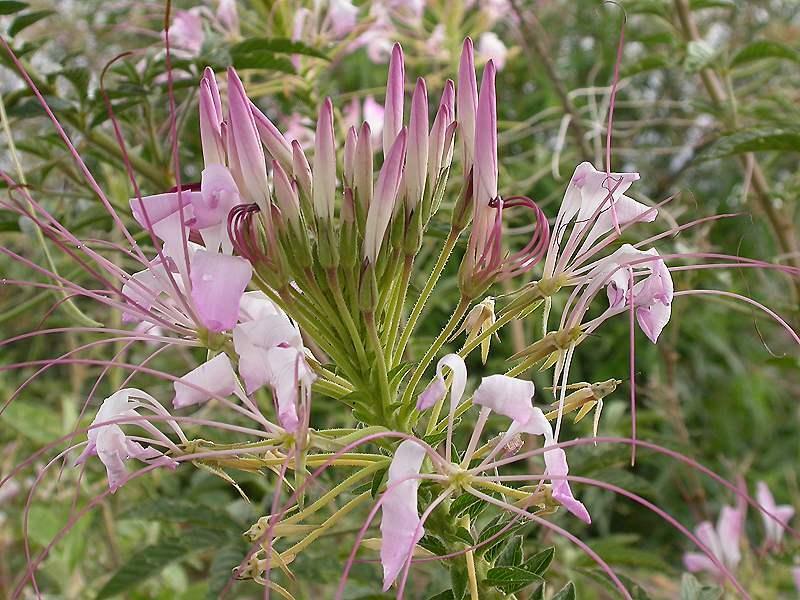 A phylogenetic study of the New World Cleome (Brassicaceae, Cleomoideae). Ann. Missouri Bot. Gard. 92: 179-201. Zhang, M. L. & G. C. Tucker. 2008. Cleomaceae. In: Wu, C. Y., Raven, P. H. & Hong, D. Y. (eds. ), Flora of China 7: 429-432. Science Press, Beijing and Missouri Botanical Garden Press, St. Louis. Woodson, R. E. Jr. 1948. 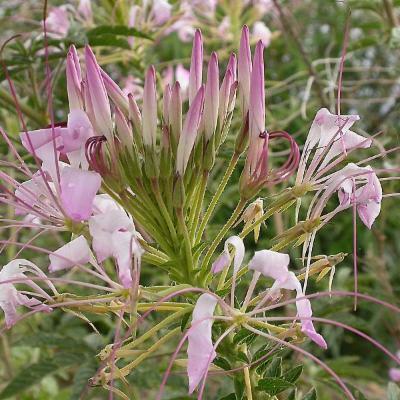 Gynandropsis, Cleome, and Podandrogyne. Ann. Missouri Bot. Gard. 35: 139-148. Dactylaena Schrad. ex Schult. & Schult.f.